When you think of Mahogany, you usually think of dark reddish brown furniture wood. That Mahogany has been stained dark. The Mahogany that we use, stays natural with no stain (unless requested). It is a very rich light brown, usually with very straight grain lines. Mahogany offers a big, warm voice with a long sustain. It tends toward mellow but is generally loud. 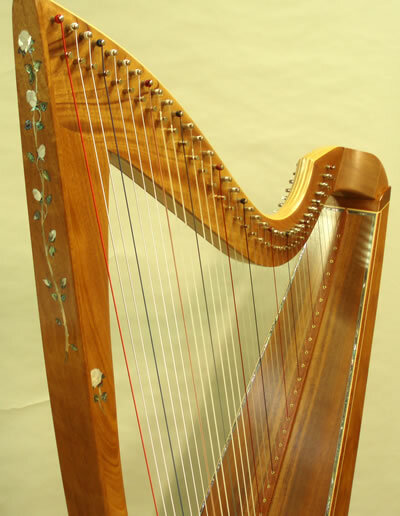 We usually use spruce soundboards on Mahogany but we have also used cedar. 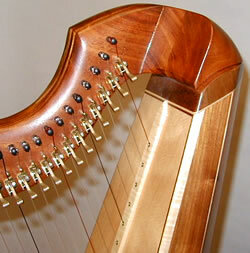 A close up of our new knee block on a Mahogany harp. 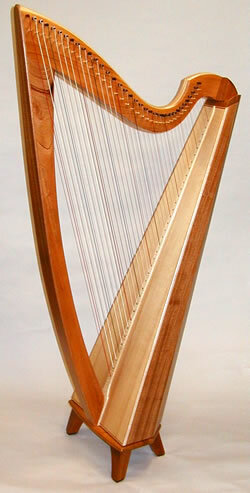 This beautiful harp is made out of some very unusual Mahogany. Most Mahogany has a very straight grain but this one has some curl to it. 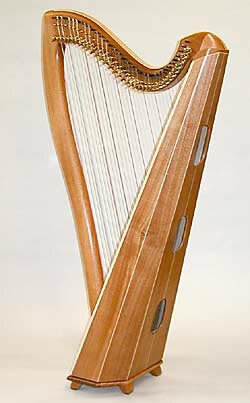 Notice how beautiful the wood in the neck is. If you're interested in the premium Mahogany, let us know. There is an extra charge for our premium wood. We can show you what we have by way of a private webpage. There is a $100 minimum for looking that will be applied to the price of your wood choice.